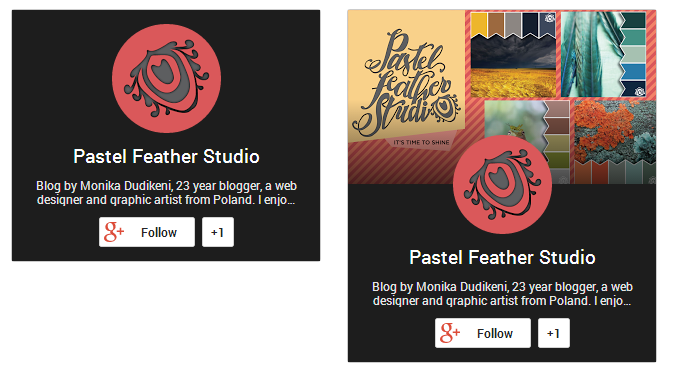 TUTORIAL: how to customize and add to blogger/website new google + badge. I'd love to visit blogger buzz to see if there is something new in blogger. 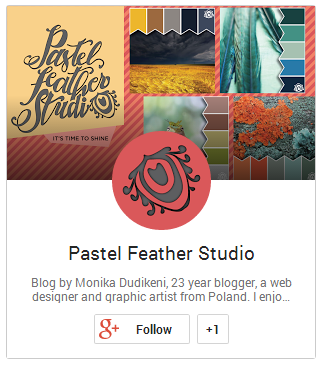 Today I saw a new g+ badge, which looks much better than the standard available in blogger - called google plus followers. Of course, if you don't want to show your followers, only your profile. 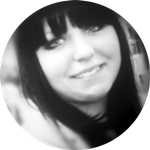 The advantage of this addition is that you can customize the look to your needs and easily add to your blog or website. 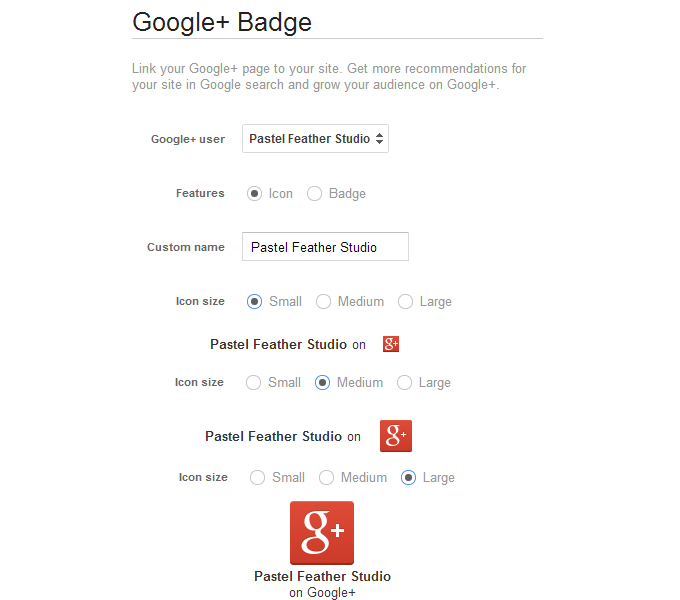 Badge is compatible with any type of profile google namely: personal profile, google plus page or community. 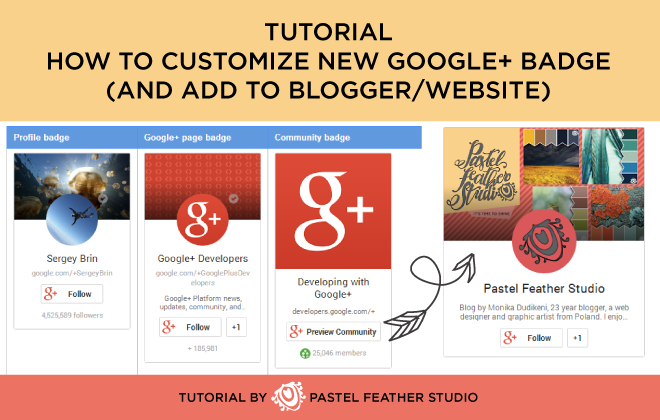 In this tutorial I will describe all the possible option to customize your badge and how to add it to your blog or site. 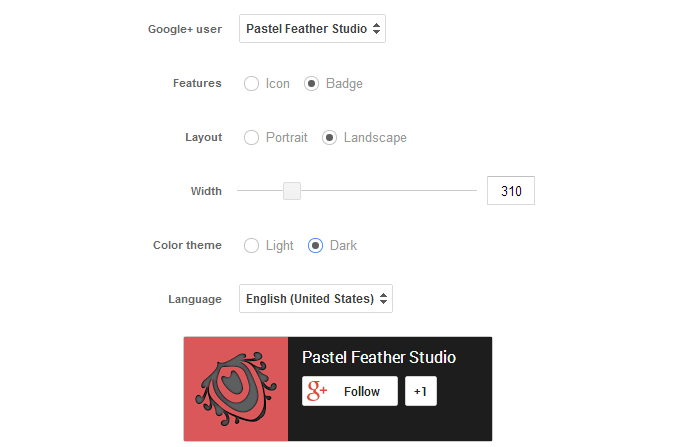 https://developers.google.com/+/web/badge/ You can then choose the appropriate profile from the list. 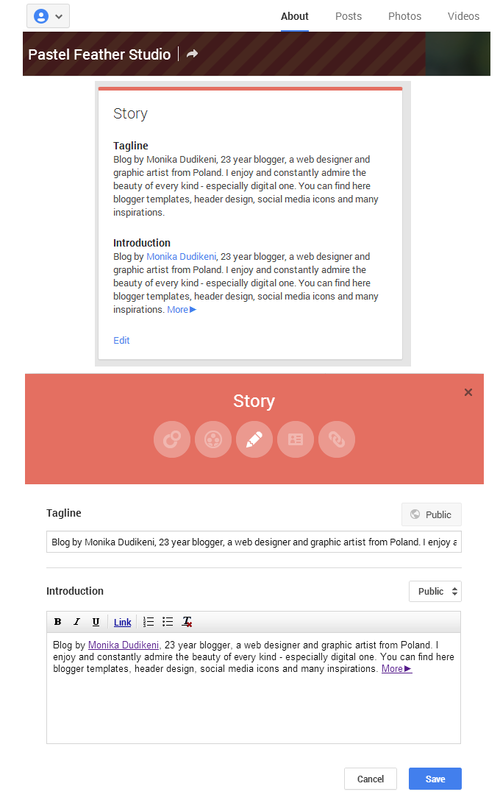 If you are logged in to Blogger or any other Google service, wait a few seconds and the site will automatically detect the user. 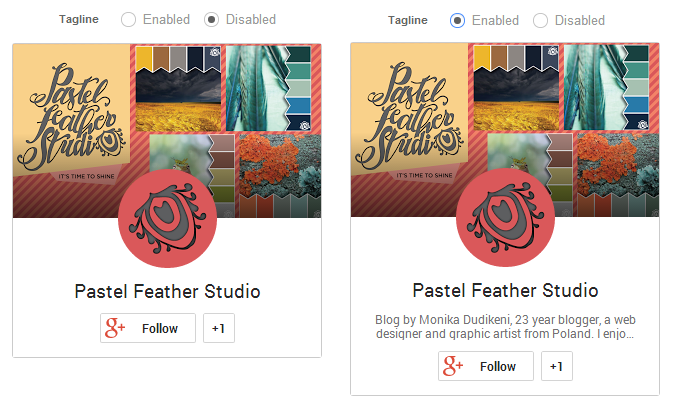 If you are not are logged in, paste the URL of your profile, g+ page or community. If you choose landscape, badge will be horizontal. You can adjust the width (max. 450 px), select the color: light (white) and dark (black), or change the language of 'follow' word. 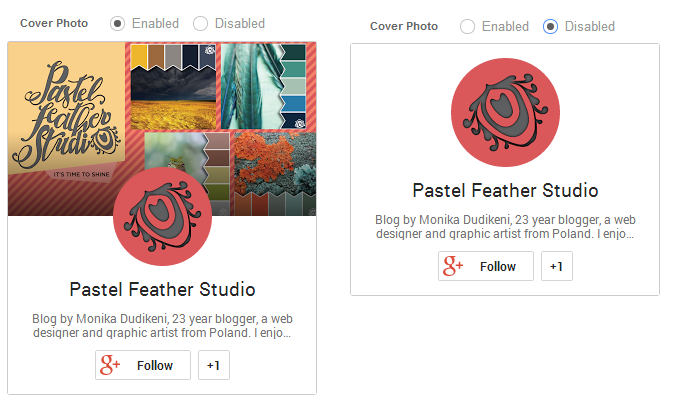 Finally we move to the most important things, the customizing badge in portrait layout. We can adjust the width (max. 450 px, min. 180 px). The height changes proportionally to the specified width. The wider the badge, the longer the length of the tagline. The next step is to choose a color scheme. We can choose between two, light and dark. Have not you noticed something interesting above? :) You can turn off the cover picture (and mix with color theme). Now we can proceed to enable or disable the tagline. But what if you want to have a tagline, but the current does not fit? We can easily change this in google plus. 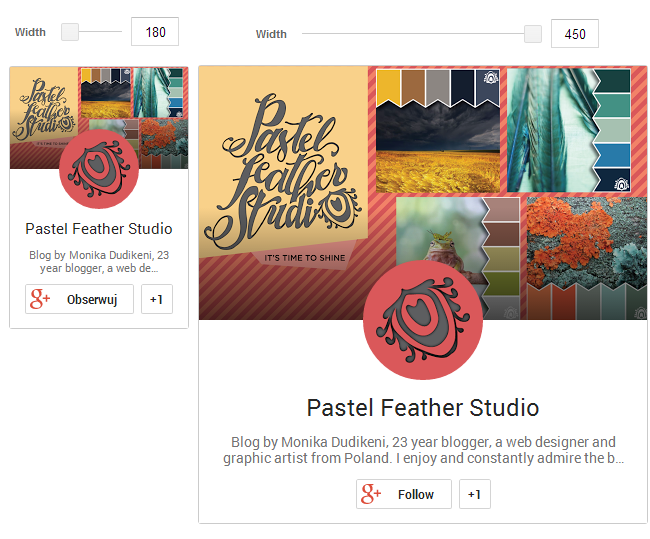 Go to your google plus profile, then into your ABOUT tab, and edit your STORY. You need to know that what is shown in the badge, it is what you enter in the TAGLINE field, not in INTRODUCTION. 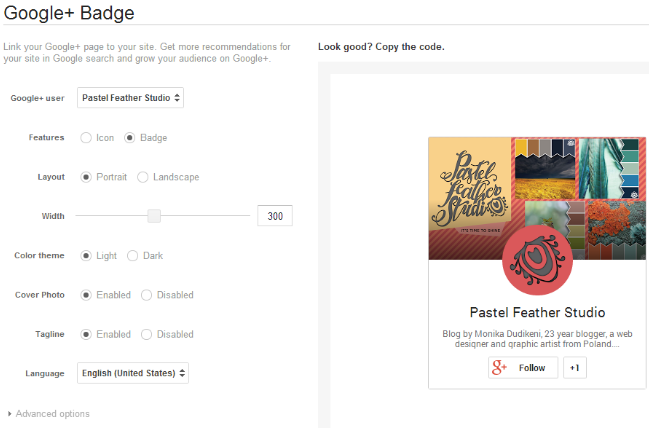 Once you have everything set up the way you want, you can install the widget on your blog. simply copy the code generated under the preview. 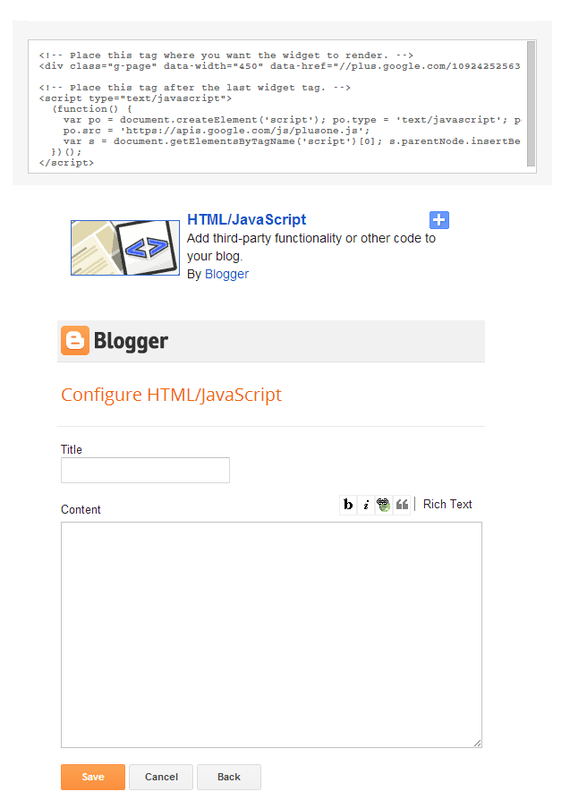 Go to blogger dashboard, select LAYOUT, and add HTML/Java Script widget. In the new window, paste the code and save it. And your badge is ready! :) Place the widget in their preferred location on the page and enjoy this beautiful widget. 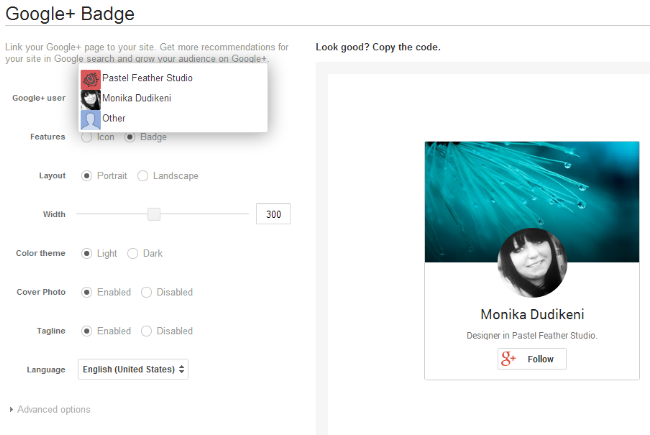 If you do not use blogger, paste the code where you want it in your website. On the google developers site (linked in step 1), you can read about other details such as the attributes of java script and HTML code. This is very handy, thanks alot!